As Adam Chitwood’s review of A United Kingdom points out, the movie is nice. It’s pleasant. It has two splendid leads in David Oyelowo and Rosamund Pike. But whereas Adam saw that movie at TIFF in September 2016, it is being released now. And that “nice” story is now a very comforting one. It’s the type of true story where true love defeats a divisive government in which officials play people and races like they’re pawns on a chessboard, and because there’s a true triumph here, A United Kingdom becomes medicinal entertainment for our current global state of affairs. Whatever aisle you find yourself on, I think we can all agree that division is what many global leaders want right now. And in A United Kingdom that division is fought with a tool that we all want to have or maintain: love. 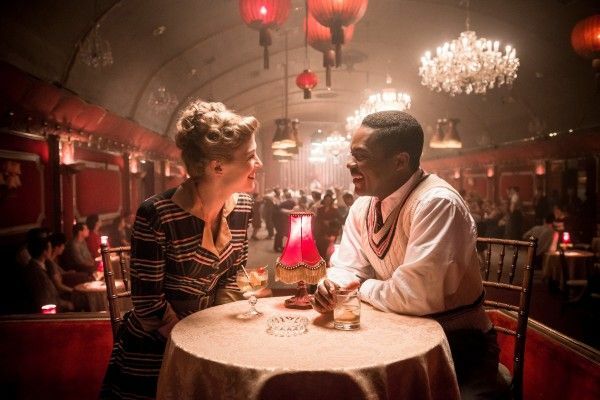 That sounds cheesy, but love leads the way in Ruth and Seretse’s story and as embodied by Pike and Oyelowo, it’s a hopeful story to follow and embrace this February 2017, particularly for Valentine’s Day. 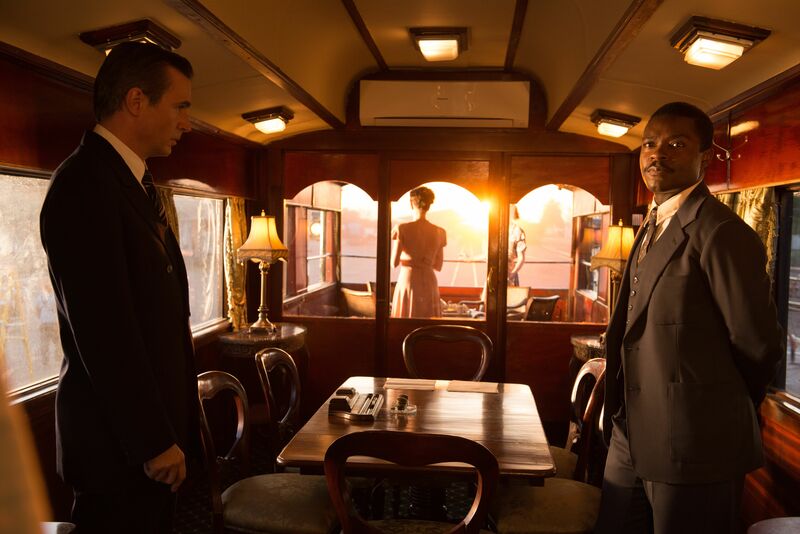 In 1947, Seretse (Oyelowo) is an African immigrant studying in London. He meets Ruth (Pike) at an academic dance merely weeks before needing to return to Beuchuanaland (now Botswana). They are instantly smitten and share records and dances with each other. When he confesses that he has to leave soon to assume his birthright ascension to the thrown, he knows he doesn’t want to leave Ruth behind, so in a whirlwind of emotion, they marry. But the British government, which runs Beuchuanaland as a colony, cannot allow their union to flourish because they are planting the seeds of enforcing Apartheid—the governmental separation of land, streets, marriage, all walks of life etc. on the basis of color—in South Africa, which borders Beuchuanaland. The tiny country of 122,000 people is thrust into a divisive spotlight and Seretse and Ruth valiantly fight back against both the British government and Seretse’s uncle, who does not approve of their marriage for ruling purposes. Recently, I sat down with both Oyelowo and Pike to discuss the film and various politics therein. There is a video interview above, but I also got to speak to them longer for a one-on-one print interview, which follows below. With Oyelowo, who is also a producer on A United Kingdom, we talked about adapting the Khama’s story, interesting tidbits that were left out and what we can learn from their story today, 70 years later. Additionally, he had some very intelligent and impassioned things to say about how Hollywood can hire more female directors (Kingdom was directed by Amma Asante), how A United Kingdom is an example of how to better tell an African story and why he’ll never miss the opportunity to work with Ava DuVernay (Selma) again. In addition to being a delightful and informative interview, Oyelowo will also get you hyped for God Particle, the newest addition to the Cloverfield universe. COLLIDER: So you’re not only a star in this film, but you’re also a producer. Can you explain how this project came to you and how long you’ve been working on it prior? DAVID OYELOWO: Yeah, it was 2010. I was doing a film in Atlanta, a film called 96 Minutes, and one of the producers of that film, Justin Moore-Lewy, had the rights to a book called The Colour Bar which had been written by Susan Williams about Seretse Khama and Ruth Williams. Literally, it was seeing the image of them on the cover of that book that really intrigued me. It was clearly the 40s. This man, arm-in-arm with this woman. They just seemed so happy, and that’s not an image you get to see every day. I read the book and subsequently couldn’t believe I didn’t know this story, and it just felt so right and ripe for a movie. I was kind of shocked that it hadn’t happened before but, of course, you know, so much of what we get to see as an African narrative that crosses over to the West anyway is not this kind of protagonist, in terms of Seretse. What we tend to see is some journalist, usually white, who happens upon their story, and we follow them as they kind of put Ruth and Seretse on the periphery, and there’s sort of this weird notion that that’s the only entryway for a Western audience to an African narrative, is to be kind of guided by a less important character. So I just felt, this is an opportunity to show a different side, of not only an African story, but an international love story that happens to have the kind of protagonist that I want to see and very rarely get to see. And when we talked yesterday, Rosamund said that you called this the most romantic story of the century. OYELOWO: I mean, it’s real life Romeo and Juliet. And not only is it Romeo and Juliet, it’s not just familial objection that they are facing, it’s from countries, it’s from society, it’s to do with cultural prejudice pertaining to the time. And they win. Unlike Romeo and Juliet, they don’t wind up dead. [laughs] You know, and I just found it so romantic. I mean, a film I really love is The English Patient and when I read their story, just sort of images of that, of that cinematic rendition of the story is what played across my mind. I know this debuted at TIFF, or I don’t know if it debuted previously in the UK, but it debuted in North America at TIFF. OYELOWO: It debuted worldwide at TIFF, yeah. A lot has changed in viewing it now, it’s really nice to see that this can triumph. We kind of need triumph for this type of story at this moment where the world is experiencing some collective grief at where global politics is going. You had the rights to the book, etc. Were there some interesting asides of their relationship that you couldn’t include due to editing, pacing? In film, you have to leave out a number of things, were there some aspects of the relationship that you weren’t able to fit in there that were very touching to you? 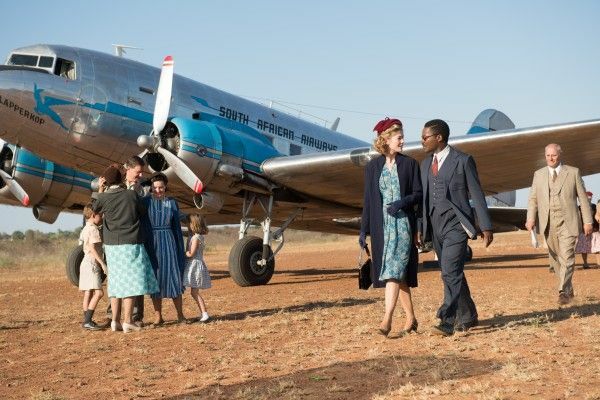 OYELOWO: Yeah, something that was incredibly interesting to me that we couldn’t quite get in because it would’ve ended up being a double beat was the fact that Seretse really didn’t like white people. He had suffered quite a lot of racism when he was studying in South Africa, and so his uncle, as depicted in the film, his Uncle Tshekedi partly sent him to the UK to get over his own prejudice towards white people, because you’re going to have to deal with them because we are a protectorate, we are a colony of Great Britain and we have South Africa right over the border. So that, to me, really in some ways accentuates just how miraculous it was that he fell in love with this white woman, and the fact that love doesn’t see color. We didn’t put it in the film, because you very much see opposition to a white character in the shape of Rosamund’s character when she goes to Botswana, so you didn’t want to play that beat twice, but that was something that was very interesting, and in the mini-series version that would’ve been a cool thing to explore. That’s very interesting, because in the film the sight of her is a very quick attraction, but if he had that previous lingering prejudice at that point, had he already gotten over it? Or not over it, but a little more over it by the time he met Ruth? OYELOWO: I honestly think these two people’s spirits, their souls, connected, and it was something that they couldn’t quite quantify. When you even read a book like Colour Bar, you feel the fact that despite all of this politics that is in the book, there is this human element of—whoa! This thing happened. This chemical thing happened between these two people that made them feel inextricably linked, which is why—you know, Seretse wasn’t naive to what this would mean but he just couldn’t walk away from how he felt about this person. And so what we tried to do— and it was a real challenge for us in making the film, because we live in an age where the idea of love at first sight is a more challenging one to accept, but it happened very quickly with these two people. And we also wanted it to be a film less about how they met and all that, but about the opposition they faced. But yeah, that’s how it went down. I wanted to ask about swing dancing, was this your first time? time. This was not a time where, certainly between these two specific characters, they didn’t just fall into bed with each other after a few dates or anything like that. Their love of jazz, their love of going to these dance halls must have been electrifying for them because they were suddenly in a physical proximity to each other that in different settings wouldn’t be the case, and that must have been just exhilarating for them, and that’s one of the things we tried to show with the film. Their courtship is—we think of that as so distant and, like you said, after a couple dates you don’t fall into bed or whatever, but there are many things that are the same when we court now, the fact that they’re sending each other records, I mean, we make mix tapes and mix CDs and playlists and things. The romantic pursuit still has some similarities across 100 years. OYELOWO: It is, but I do go back to this chaste thing. And also the depiction of love on film. So often, we see lust sort of portrayed as love. This story, in my opinion, was true love. This was two people falling in love with each other’s minds, their souls, their emotions were engaged in a way just—I think now, certainly the shorthand for that is physical, is the physical, sexual expression of that, and that just wasn’t, you know, as far as we can tell, they didn’t actually sleep with each other until they were married, which is, again, something that is very rare, and I would argue also makes them kind of a special couple at this time. Which just goes to show that there was something a bit more, I don’t know, something more grounded, something bigger, in terms of their desire to be with each other than I think can often feel like is the case in modern society and certainly in modern day film depictions of love.